An exhibition featuring sculpture and video works by Rachel Frank and Heidi Lau entitled “The Sentinels” is on view at Geary Contemporary through July 14, 2018. Focusing on the perspectives and placement in the shifting landscapes of time and history in a literal and metaphorical sense, “Sentinels” or guardians are represented in various repetitions throughout the exhibition. For instance at the front of the gallery, Lau’s gargantuan hand-built ceramic serpent and flowing landscape "The Primordial Molder" is displayed. The ceramic wall installation and video in the rear gallery shows disembodied pairs of hands expressing a broken and amplified disarranged past. 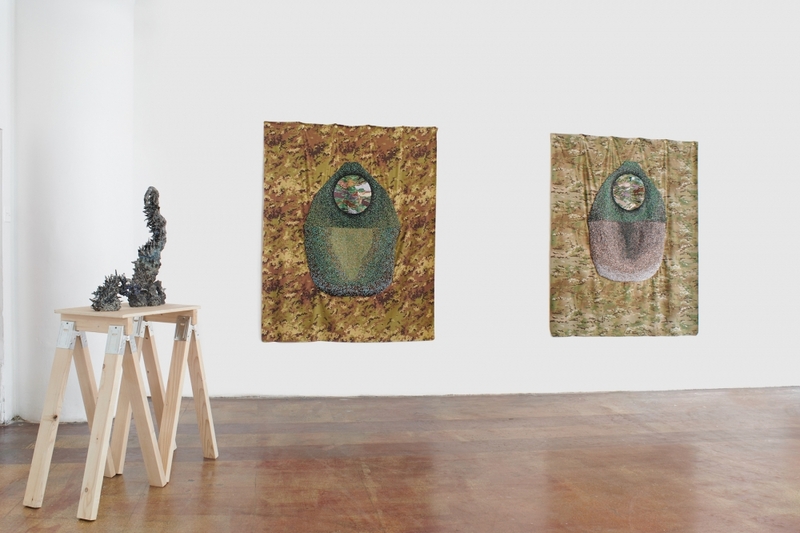 Frank’s hand beaded “Pattern for a Yurt” panels displayed on the adjacent walls suggest the need for the possibility of transformative structures during disastrous times. Lau’s ceramic series “Mountain of Knives” refers one of the 18 levels in Taoist hell. Similarly, Frank’s ceramic rhyton vessels placed in the center of the gallery are based on ancient Eurasian clay vessels that imitated animal shapes and held liquids for ritualistic ceremonies that were performed to influence the gods. The video in this exhibition explores the historical ways man divined the future and the strong influence over natural processes. It is filmed alongside an extinct woolly mammoth speaking in fragmented monologue. Both the artists convey the reality of an uncertain future which is made aware by the materiality of the past. The hopeless evidence during the course of the human kind is examined with suggesting the downtime in the form of rapid expansion and collapse leading to disaster and chaos that are counteracted by guardians who observe our real and mythological worlds as a person who can profess to foretell events. Through interpreting the past, they attempt to reform the future.